In 2000 Records of Huntingdonshire (Vol.3, No.8, 2000), the Journal of the Huntingdonshire Local History Society, included an article about John Ferrar of Little Gidding by D. R. Ransome. The article has been updated, notes by the author and also supplementary notes were added to this digital copy. The Society is pleased to be able to republish this article with the kind permission of the author D. R. Ransome. ‘For a century and a quarter Little Gidding was the home of the Ferrar’s. 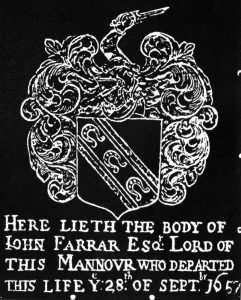 When they came there in 1625 the family consisted of the old Mrs Ferrar, her married daughter Susanna and her family, and two of Mrs Ferrar’s sons. The younger was Nicholas, who is famous, but the elder, John, is undeservedly less well known. This article is an attempt to redress the balance and tell something of John’s life. To read the article click on the picture above.